Previous rules of thumb for climate change worsened wet/dry turned upside down | Watts Up With That? WET areas have become wetter and dry areas drier over the past 50 years due to global warming, a study of the saltiness of the world’s oceans by a team including CSIRO researchers has shown. The intensification of rainfall and evaporation patterns, which is occurring at twice the rate predicted by climate change models, could increase the incidence and severity of extreme weather events. Based on models and observations, climate scientists have devised a simplified formula to describe one of the consequences of climate change: regions already marked by droughts will continue to dry out in the future climate. Regions that already have a moist climate will experience additional rainfall. In short: dry gets drier; wet gets wetter (DDWW). However, this formula is less universally valid than previously assumed. This was demonstrated by a team of ETH climate researchers led by Peter Greve, lead author of a study recently published in Nature Geoscience. Traditional analyses use metrics that can comprehensively describe climate characteristics above the ocean, but is problematic over land. While this fact was mentioned in said studies, scientific and public discourse has overlooked this aspect so far. In their new study, the ETH researchers in the group headed by Sonia Seneviratne’s, professor for land-climate dynamics, take into account the specific climatic properties of land surfaces, where the amount of available water is limited when compared with the ocean. In their analysis, the climate scientists made use of measured data compiled solely on land, such as rainfall, actual evaporation and potential evaporation. The data derived from various sources was combined by Greve and his co-authors – this allowed them to extract trends in terms of a region’s humidity and dryness. Furthermore, the researchers compared data from between 1948 and 1968 and 1984 to 2004. The evaluation shows no obvious trend towards a drier or wetter climate across three-quarters of the land are. There are solid trends for the remaining quarter. However, only half of this surface area follows the DDWW principle, i.e. one-eighth of the total landmass, while the trends seem to contradict this rule over the other half. Some regions which should have become wetter according to the simple DDWW formula have actually become drier in the past – this includes parts of the Amazon, Central America, tropical Africa and Asia. On the other hand, there are dry areas that have become wetter: parts of Patagonia, central Australia and the Midwestern United States. Nevertheless, the ‘wet gets wetter’ rule is largely confirmed for the Eastern United States, Northern Australia and northern Eurasia. ‘Dry gets drier’ also corresponds to indications in the Sahel region, the Arabian Peninsula and parts of Central Asia and Australia. However, the DDWW principle does still applies to the oceans. “Our results emphasise how we should not overly rely on simplifying principles to asses past developments in dryness and humidity,” Greve explains. This can be misleading, as it cannot do justice to the complexity of the underlying systems. “assessments of observed continental dryness trends yield contradicting results. The concept that dry regions dry out further, whereas wet regions become wetter as the climate warms has been proposed as a simplified summary of expected as well as observed changes over land, although this concept is mostly based on oceanic data. @borenbears one my toughest challenges. Explaining to linear thinkers that dry/drier, wet/wetter is expected. They want either or. September 15, 2014 in Climate News. They call the Climate a “Chaotic System” for a reason, trying to apply simple “Rules” to it is sheer stupidity. As your last line says “So much for Certaintity”. Settled Science, they must be joking. No, no, no, the “settled science” part just means you don’t get a say, silly. Couldn’t agree more. I am constantly dumbfounded that so called scientists just can’t seem to understand the word chaos.It would be much easier to forecast next Saturday night’s Lotto draw than some of the stuff they spend their time (and our money) doing. However, the DDWW principle does still applies to the oceans. Interesting! Oceans are getting both wetter and drier! Funny, I’ve never seen a dry ocean, have you? Area 51 is on a dry lake bed… is that close enough? Its been dry a long, long, time. It’s almost wrong to call it a lake bed at all. So what is the role of CO2 in all this? it obviously is nothing to do with warming for another simple reason. Actually its very simple, try to keep up. As you can see, climate change causes a variety of changes to the climate – the clue is in the name. THE PLANET HAS A FEVER – AND A RUNNY NOSE. iT IS AN EMERGENCY AND WE MUST ACT NOW OR MORE PLACES WILL GET WETTER OR DRYER OR STAY THE SAME. At least they have 95% confidence in it and 97% of real scientists agree with it! When you can pick the “real” scientists, you can claim anything. Well, lets hope Australia, a land of both droughts AND floods, will be in the 10% where the wet gets drier and the dry gets wetter. Still, 10% follow the rule, 80percent show no correlation, and 10 percent opposite correlation- isn’t that just the statistics of random chance? No because your theory has not been peer-reviewed in a leading climate scientist approved journal. That is exactly where my mind went also. It always was utter drivel anyway. The SW of Western Australia and Tasmania are both wteer areas but have got drier and that has been a trend for a century or so. The rest of the continent has got wetter, especially the north but also generally. More cherry picking by our idiot climate ‘science’ perpetual undergraduates. I think you’re being fooled by unadjusted ‘raw’ data. Once the data is properly calibrated it’ll show that any increase in droughts (or floods) before about 1960 was slow and gradual (virtually flat) then shooting up at the end of the last century as the CO2 increases kick in. This is the case with all negative climate effects, but often the raw data is corrupted by errors that mask the real trends. Jaffa: Ooh you are awful. But I like you. In 2007, ex Climate Commissioner, Prof. Tim Flannery (recently fired by the current federal government) predicted cities such as Brisbane,Melbourne, Adelaide and Sydney would never again have dam-filling rains, as global warming made the soil too hot, “so even the rain that falls isn’t actually going to fill our dams and river systems ..”. At the moment those dams are over 85% full with a number of expensive desalination (built partly based on Prof. Tim’s Global Warming mantra) in mothballs and costing the tax payers billions of dollars. Why don’t they use the desal plants and ship the fresh water to other countries less fortunate? Very noble. Who’s going to pay for YOUR generosity? Made the soil “too hot”??? Plainly slept through chemistry and physics. And one of those desalination plants, Kurnell in Sydney, is costing us Australian tax payers an incredible $195 million a year — or $534,246 a day — in “service fees” just to have the plant on standby. The plant in Kurnell, which is jointly owned by a Canadian pension fund and an Australian fund management company, was turned off in mid-2012 as Sydney’s dams surged to nearly 100 per cent full. Water levels have remained high ever since and as a result the desalination plant has never been switched back on. Well 25 k years ago most of Australia was a giant sand dune field else covered in gibber plains where the sand wasn’t, with stuff all vegetation anywhere away from the coast, and the continental high was constantly blowing huge dust storms into the Tasman sea and South Pacific basin and deflating and destroying whatever soil was considering forming. So in those terms it seems pretty clear that very dry gets much wetter when very cold gets much warmer. The result of the warming was soil re-development and vegetation colonization and stabilization of the prior continental scale sand dune fields and an explosion of wildlife colonization which followed. In other words Australia loves warmth because the permanent high pressure drops south of the continent, lows form over land again which brings back the humidity, soil reforms as plants re-colonize where it had been impossible to survive and the animals come surging back across the continent again. It is indisputable that a warmer Australia is on average a wetter Australia, with more lows and less highs for more of the year. The dry season is made shorter and the wet season is made longer. We could probably fix the dryness in Australia by leveling the Himalayas to a flat plain. Take a bit of excavation, that, but it would change the flow pattern of the monsoons enough to bring persistent rainfall back to Australia. Plate tectonics and the resultant mountains have really played havoc with the climate patterns. Pity. No thanks- I love my subtrend country, a land of sleeping brains, of mounting shagged rangas, of rorts and flooding drains. Anyways, luckily Marshall Shepherd is not a linear thinker, but apparently more of a circular thinker. After all climate change is caused by climate change. normal gets drier and wetter in a wetdry kind of way. Now falsify that! This is climate science in a nutshell. But what about SSHHTT????? The bedrock of human caused catastrophic weather donchaknow. And there’s a problem with that? This finding of essential randomness is useful. Perhaps it got by the gatekeepers because randomness never shakes true belief. Always stood for Single Sided Double Density for me, but I’m not sure how that applies to wet and dry. I thought I was confused before I read this, so thanks for clearing it up for me. Now I know I am. Annual rainfall in the relatively weak rain-shadow of the mid-Appalachian ridge & valley region has increased over 10% (30 yr averages) since the 50s to 80s. So, is that wet-getting-wetter or dry-getting-wetter? The paper was published this September. Does anyone know why they stopped at 2005? Is there no data they could have used up to 2012? Here we present an analysis of more than 300 combinations of various hydrological data sets of historical land dryness changes covering the period from 1948 to 2005. It may be nothing but I always get suspicious of cut-off dates. Sometimes cutoff dates are valid. Sometimes the data goes the wrong way and can’t be used as it is clearly erroneous, sometimes the gap can be filled with different data that comes from somewhere else but goes the right way. It’s all very complicated and sciency and only real climate scientists understand the process. These guys stopped at 2009. See what they found. Oh Dear, do we have to have Mr Palmer and his Palmer United Party giving us a Drought Severity Index. We already have enough trouble with them in the Senate! This is not a problem for post-modern climate theory. Change gets changier and changiness gets changified, unless things stay the same. In which case it is the change that has changed, so it still fits the theory. Change gets changier and Hope gets hopier. Ah, that rascal real-world data strikes again. It’s becoming the antichrist of the Church of Climatology. 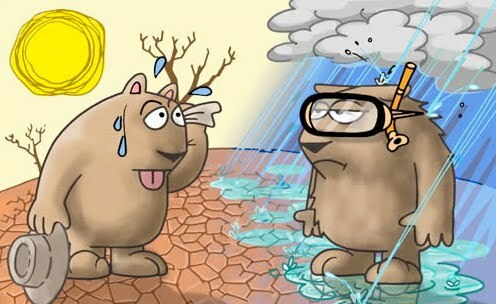 The wet gets wetter, the dry dryer appears to be just one more claim by the Warmist/Alarmist crowd that is incorrect, although since it is being blamed on “climate change” and not specifically CAGW, there will be some places, as the OP notes, where the wet does get wetter and the dry does get dryer. Except, when the wet gets wetter and the dry gets dryer, can that really be classified as “change”? Didn’t I see this script in a 007 movie? Or was that Matt Helm? Sokay, I didn’t believe it then, either. Maybe they should try “the normal get’s more normal”? Excuse me but, I believe the term should be normalier or normaliest. Either is accepted in polite company. As long as the models get more righter. IMHO we need to be careful about what tense we use. That is, are we describing a general principle for which causation has been proved, or merely describing actual data? As I understand it, the paper addresses only data. It says that10.8% of the global land area consists of wet area that got wetter or dry areas that got drier within the time period reviewed. However, the fact that these changes are “robust” does not prove that they were caused by global warming or that these changes will continue in the same direction going forward. I’m a nonlinear chaotic laterally lucid thinker, and I don’t buy the “expected” at all; as no climate model has ever demonstrated predictive skill beyond time scales of days. Thanks, DirkH. You forced me to read that quote twice, and confirmed my earlier impression that it makes no sense at all. So yet another climate obsessed prediction bites the dust. And skeptics are proven correct, yet again: There are no significant, dangerous or dramatic trends in the climate. With regards to the CSIRO, all i have to say is cane toads. Using the last 12 months, the USA is slightly above normal in precipitation. 0.57″ above the long term 29.94″ average. However, if you set the base period to 1945-2014 it is 0.18″ above normal. So … it is normal. Especially considering there is a 10″ swing from lowest to highest since 1895. Does CO2 affect precipitation? No. I wonder what the error bars looked like? You’ve got a 10% chance the area will get more of what ever it’s got and a 90% chance It will change. Not sure what happens if you neighborhood is normal/average. What happened to global warming making things hot? You know, CO2 goes up evenly all over the globe. 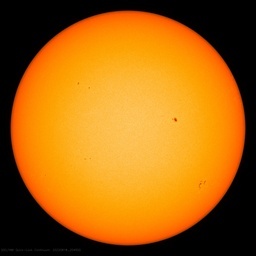 Then the sun warms the CO2 and makes “global warming”. Or does it make hot hotter and cold colder? I’m sure Marvel Comics could have come up with a better storyline. So, is this yet another failure of GCMs? People say these models are useless, and they are. All these studies do is amplify what I like to call the “Rainy Day Fallacy” (Maybe it’s already got a name, dunno). The very short time we’ve been studying this stuff with any accuracy is tantamount to sticking your hand out the window to discover it’s raining. Then 10 minutes later you discover it’s raining harder. Extrapolating that trend will get you a global flood in no time flat. In Western Washington, if you can’t see the mountain (Rainier), it’s raining. If you can see the mountain, it’s going to rain. I can’t see it from my house most of the time. Has to be a really clear day. But I’m pretty far north. “Half of the surface areas show divergence” – so half of the land area shows ‘climate change’ and the other half doesn’t. In half that does show climate change, part shows the ‘dry gets drier, wet gets wetter’ the pattern. The other part shows the opposite pattern: dry gets wetter, and wet gets drier. This is all over about 1 cycle of the PDO. The climate is changing, except where it isn’t, and the climate is getting worse, except where it is getting better – for now. They don’t realize how stupid they sound. They truly believe they’re the smart ones. Following their model, we could say “the dumb get dumber”. Shawn: If you look out of the window, that’s a normal cliamte, whenever you look, no matter how often you look. In other words: precipitation over land varies in an utterly unpredictable fashion. With lots of random time series most of them shows no trend, but the rest either goes up or down. This is what Greve et al. have found. Clever. Hmm, the Sahel (strip south of the Sahara) is actually greening and getting wetter. Looks like the “dry gets drier” walk-back might still need some more walk-back. That is bad news now that we seem to be in for a substantial turn of global cooling, which will probably undo that greening of the Sahel. In typical eco-“reporting” fashion the National Geographic piece above does not name the paper, just giving the journal and the 1982-2002 dates. That is enough to find the paper via Google. It is titled “Disentangling the effects of climate and people on Sahel vegetation dynamics” and the abstract is hilarious, in a weeping-world kind of way. They studied whether this unambiguous greening could be due to human land use changes, and as the title makes clear, the competing hypothesis is that this benign change would have been due to “climate,” which warmed a little bit over the period, but the abstract never mentions the competing hypothesis. They just say that the change seems not to have been caused by human land-use changes (greening happened everywhere, regardless of human uses or changes in human uses). Despite the paper’s title, the abstract studiously ignores how the “disentangling” they have successfully conducted implies that the greening was likely caused by global warming. The implications seems to be that they were afraid of losing funding if they actually stated the implications of what they found, but they must have wanted to say what they found because they state in their title what a negative human-use finding would imply. They just never connect up that implication when they report their findings, even though it is in their title. Amazing. So this is what 100% politically funded science looks like. Scientists whose findings point in the politically-disfavored direction still report their findings but just omit to mention in which direction they point. It’s like reading Pravda during the cold war. People in the know see to read between the lines while the “useful idiots” fool themselves that their presumptions remain unchallenged. Please can someone explain what they meant by “Each combination of data sets is benchmarked against an empirical relationship between evaporation, precipitation and aridity. Those combinations that perform well are used for trend analysis.“. That looks like confirmation bias to me. Why is it so hard for them to say that they don’t really know how these major climate systems work? wouldn’t that be the scientific position? Would something bad happen? Earthquake, giant Williwaw, a cut in grant allocation? When’s the next big assembly of climatologists because we still have a “research aircraft” available to help them……. Precipitation presents a natural rhythmic variation. The temperature follow this in opposite way. If we select a truncated data within a cycle, based on the period of the cycle, we get different conclusions. This is generally happening. Two years back, a minister informed to Indian parliament that monsoon rainfall is decreasing. This year researchers from Stanford University published a paper contrary to this. Here the fact is monsoon rainfall presents 60-year cycle — already completed two cycles and third cycle started in 1987 with the above the average part and is going to complete by 2016. Former used data part of last but one sine curve [0 to +1 to 0 to -1 to 0] and the later used data part of last sine curve [0 to -1 to 0 to 1 to 0]. It has become common. In Mumbai, Santacruz Airport for building international airport terminal they cut the hillock in the runway over a period of time. This reduced the precipitation. With passing of time all around high raise buildings have come up. The scene come back to original.This can be seen by comparing rainfall of Alibag and Santacruz in Mumbai.